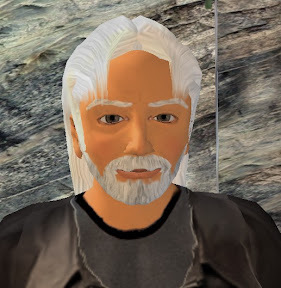 Well, following my last blog entry bemoaning the fact that SLeek had been broken by the recent changes to SecondLife, I am pleased to say that the latest version has fixed the problems and is better than ever! The interface works... though I made the mistake of forgetting to select "use last location" rather than "use Home location" when I logged in. This meant I materialised in one of the welcome islands rather than in the nice safe place I left my avatar the last time I logged out! However, fortunately the teleport works, & I was able to spirit myself away to meet Aleister and his friends on the Comcast island. I was also pleased to see that it is now possible to pull down the user profile of the people around you... so at least (when people had put their photo in their profiles) I was able to get a idea of who I was speaking to! There is also a neat map viewer.... give it the name of a location and it will bring up the thumbnail map. 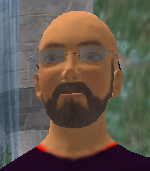 Unfortunately there's a bug in the libsecondlife library, so it always reports that there are no people in every area! Still, the interface works - chat works; IM works; teleporting works. It also has the option of connecting to the beta and teen grids (though I haven't tried these out). I can certainly recommend SLeek to anyone who would like a chat/im interface into SL and doesn't quite have the graphics horsepower to run the full interface (in my case, my home PC will run SL with no problem, but my "company laptop" doesn't stand a chance with full-blown SL). Thanks again to to Delta for updating the code. It was a bit spooky that you remained "ruthed" - normally it only lasts a few seconds - which suggests some kinds of glitch in retrieving your avatar details. For info, the lady behind you is Kathleen Millionsofus. where may i DL the new SLeek? i got it from a google site and it said "failed to initialize"
also, many sites say SLim and SLeek hae been removed by linden labs. why?